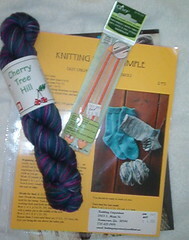 It's Cherry Tree Hill Supersock in "Spanish Moss." I decided to do the whole cardi in Dried Herb instead of two different colors because Elann released more of the Dried Herb. Well, I've almost made it through my 2nd week of full time. It's going pretty well so far! We're handling it better than I thought we would, and the extra money has definitely been nice! That's all for now! Write more soon!